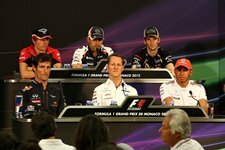 Drivers - Romain Grosjean (Lotus), Pastor Maldonado (Williams), Charles Pic (Marussia), Mark Webber (Red Bull Racing), Michael Schumacher (Mercedes) and Lewis Hamilton (McLaren). Q: Romain, first of all, tell us about your experience of the Monaco circuit. Romain Grosjean: Well, first of all, different feelings in Monaco: special track; special grand prix. For sure for us is a little bit home because we are close to France, so very happy to race in front of the fans, hopefully a lot of blue, white and red flags in the tribune. But Monaco is a special track, good experience that I won here in GP2 in 2009 and last year I did a really good race starting 26th and finishing P4 but then I’ve had some crashes as well. Let’s see what it gives in a Formula One car - I’m sure even better and we’re really looking forward to driving here. Q: There have been some circuits where you have performed, perhaps, better than others. Is this one where you feel it is going to be good for you? RG: I like the track, let’s see what we can achieve. But you know, Monaco is a little bit different to the other ones: normally if you are good in a fast corner you know that more or less every fast corner you are going to be good - but here it’s bumpy, it’s in the street, the track is improving a lot during the weekend. There is a lot to learn and it goes really quickly in between the race, so it will be interesting to see how it goes. We are trying to set up the car as good as we can, achieve another strong result for the team and for myself as well and score some good points, and why not more. Q: I’m sure there’s huge support for you in France, and this is probably the best chance France has had of winning this race for many years. RG: Ha-ha. The last French winner here was ’96 with Olivier Panis. It would be nice to have La Marseillaise on Sunday but let’s work before that and see what we can achieve. But for sure having a lot of fans is always good support and something quite special when you go around the track and do the drivers’ parade. Q: Pastor, first of all, after Barcelona, what have you been doing, what’s happened, the reaction in Venezuela, have you been back to Venezuela? Have you been to Williams? Tell us. Pastor Maldonado: Yeah, I’ve been in the factory at Williams, working with the engineers, with the team, and I passed some very good days with them in the factory. It was a special one because after eight years without winning any races, you can imagine how they take this victory. For sure it’s a great feeling to start winning some races. The team is pushing so hard, me too, we have a very good feeling and are looking forward for the next races. Q: This circuit, again, has been a good one for you. Do you feel you’re a bit of a Monaco specialist. PM: I’ve been always so quick here, especially in GP2 and World Series as well. Last year I was doing a good job, I was P6 but it’s always difficult. This kind of track, you never know for the traffic, for everything. The track is going to change a lot during the weekend and we need to follow the track and we need a very good balance in the car as well and be ready in the right time in the track. So, we’ll see. I will do my best, again one more time and we’ll see. I believe it is still possible to be competitive here, then we’ll see. Q: Do you feel there is a certain relief having won that first grand prix? PM: It’s really special to win, especially the first one. But for sure it is going to be difficult now. The gaps and the team levels are so close, so anything can make the difference, we need to put everything together to make a step forward, and I need to say that Williams are doing a very good job at the moment, I feel all the people are very motivated, they are pushing so hard - me too - it’s a very good feeling in the team and you know, still we need to improve. We are not at 100 per cent at the moment, we are not the best team - but we are not that far, we are there and we need to try to improve every time. Q: Charles, you’ve won in GP2 and in World Series here, can you imagine what it is going to be like in a Formula One car? Is it going to be a big difference? Charles Pic: I think there will be some for sure - but the track stays the same. So it will be my first experience here in F1, this is a very nice track and a little bit special because it’s not allowing any mistakes from the drivers, so I think it can be a really interesting weekend, especially for us. It’s interesting to see our pace on a type of circuit like that, it is quite different to other circuits - so yeah, we’ll have to see. Q: You had a difficult start to the season: no pre-season testing - or virtually none - how do you think things have gone in the first quarter of the championship? CP: Good. I think our main aim is trying to improve the car race by race. It’s what we make, we still have to work very hard and continue to push like that to try to make it better. On my side I have many things to learn. It was not easy for the first few races without any testing but I made my best and I feel better prepared race after race. We have to continue like this. Q: Mark, your first podium here, you always remember your first podium I’m sure. Is this a very special circuit for you? Mark Webber: Yes, it has been. I think winning here in F3000, a couple of podiums, obviously the nice victory in 2010, so it’s an amazing venue, it’s an amazing weekend. It’s quite stressful for the mechanics, all the teams, obviously you guys, everybody getting around, it’s amazing how we still manage to hold an event here in such tight confines of the Principality. But it’s a great sporting event and one that’s very popular for all of us. And, yeah, I’m looking forward to driving the car. It’s always great to drive here, so tomorrow we can get on with it. Q: We’ve never known a season like this before and I think it’s the same for all three of you, it just doesn’t seem to be consistent. It’s just up and down. Is that a bad thing or a good thing as far as you’re concerned? MW: It depends on who you are. I think for the purist, I think people are taking a little bit of time to get used to it. Obviously, no one’s really got any momentum yet in terms of results in teams. But obviously there are a few people that follow the sport that love it like this. It depends who you ask. If you want to have lots and lots of different teams being competitive that’s the way it is at the moment, which I don’t think is too bad. But let’s see. I think ultimately the main teams will still do well at the end of the season. Q: Michael, sadly you have a five-place grid penalty here. But on the other hand you have been back there before, even further back, three or four years ago . And you saw what Lewis could do from there two weeks ago. What are your feelings about the race itself coming up? Michael Schumacher: Well, basically, I think we’re going to be in a position to be competitive. As a general track profile I think it’s going to suit ourselves. Indeed, I have been coming from the complete back and gone forward to fifth position I think. Let’s see from where I finally manage to qualify and start the race and what can be done. It is certainly not ideal, but it is what it is and I look forward to it and I’m going to have some excitement pretty certainly. Q: You’ve got a phenomenal record around this track, as you have around most current race tracks, and you have won here more often than anyone else in recent history. How do you get the ultimate performance around here? MS: Well, I mean Monaco is certainly special and there’s something about you and the car that you just have to get every detail together as you have at every track but here it just pays out more. To have the rhythm, the flow, the momentum here… if you’ve got that it just pays out a much bigger lap time than other tracks because everything is so critical and difficult here. Q: I was going to ask - is it still the circuit where the driver makes more difference than any other circuit currently? MS: At the end of the day, that’s the case, absolutely. Q: So you’re looking forward to doing that on Sunday? Q: Lewis, certainly you had a tremendous drive two weeks ago. Did you enjoy it? You said you were going to. Lewis Hamilton: Firstly, good afternoon everyone. Yeah, absolutely I was very, very happy with the performance of the team but also my performance in the last race. I was always looking to improve and I felt it was a definite improvement from the grand prix weekend before that. Q: You’ve banked at every single race and you’re just eight points off the championship lead - if anyone is consistent, you're at least consistently in the points. But is it an inconsistent season? Q: Drivers as a whole. LH: I don’t know if it’s an inconsistent season… well, potentially yeah, a little bit, because of the tyres. I think the tyres, you sometimes get them in the working range and sometimes you don’t. I think a lot of teams are struggling to understand why sometimes it works and sometimes it doesn’t. But that’s the challenge we all are faced with. But I think people are enjoying it. I notice people are asking a lot of questions about how there’s been five different winners and the fans I’ve met had said this is a fantastic season regardless, so I hope that continues. Q: Is there a little frustration that you’ve been on pole, or fastest so many times and still haven’t yet won? LH: I’m not frustrated, no. This is the way racing goes sometimes. Of course, looking at the qualifying results we’ve had for the five races, we would have loved to have finished further up and we definitely need to improve to ensure that we stay where we are or we move forwards. Yeah, we’ve started high up finished a little bit further behind from where we started so we’ve gone backwards a little bit in most of the races but we’re working very hard to make sure that doesn’t continue. Q: (Frederic Ferret- L'Equipe). Question for Pastor. How difficult has it been to deal with the fire and how difficult has it been to prepare for this grand prix for you and the team? PM: After the fire we’ve been working so hard to rebuild everything. The guys did a pretty good job because we are ready to race, with everything we need to get the maximum. And I need to say that the guys have been working full days to have everything ready for this race, so great job for them. Q: (Alex Popov - RTR TV) Question for all the drivers. Do you realistically think that on Sunday it will really be six different drivers, and to all except Pastor, do you think you will be the sixth? MW: Yeah, I think there can be six different winners. Of course, why not? And it would be nice if it’s me, yeah. I’m sure all of us are going to say that. I want everyone except Pastor to rate his personal chance to be this sixth driver - if it’s realistic or not. MS: I’m pretty sure that are quite a few around us that would have the capacity to win this race and yet have not won a race and yes, naturally I think each of us here would be happy to be the one. Q: Romain, how do you rate your own personal chances of becoming the sixth driver? RG: Difficult to say at the moment as we didn’t drive on the track yet, but I wish I could be the sixth one. CP: I agree it’s more tight this year but we are not yet in a position to fight for this. For us now we have to focus on improving step by step and that’s it for the moment. Q: (Ian Parkes - Press Association) Pastor, you mentioned that the team has been working flat out to compensate for the fire. Obviously a lot of teams came to Williams’s aid with regards to equipment, infrastructure etc, but just how much of an impact will the fire have on the team this weekend, given the loss of all the equipment? PM: Yeah, for sure it was a frustrating moment for all of us, because we were in the garage at that moment, at that time, and we saw everything. Personally, I was so scared, especially because we were all together, talking with Frank at that time and then yes, I need to thank all the teams who helped us, especially to extinguish the fire. For sure, as I mentioned before, the team has been working flat out to have everything ready for this race. The time wasn’t all that big, you know, only one week, one and a half weeks to have everything ready was quite short and yes, I need to thank all the teams who have helped us, even offering extra stuff for this race. Q: (Pierre van Vliet - F1i.com) Lewis, I understand that you moved to Monaco recently. How different is it to have a race at home, really close to your home? Maybe Michael can answer this as well, because he used to live here, and Pastor as well. LH: I love it here. To be able to wake up in your own bed and drive just down the road and be at work is a fantastic feeling. Today is the first experience of that but I’m sure it will make quite a big difference. I loved where I lived before but this is a different place and I seem to be enjoying it a little bit more. MS: Basically, not only do you feel at home, and as Lewis said, absolutely, but even seeing the build-up of the track, because when you live here you go through the roads and you see it building up, the whole story builds up in your own head and when it finally comes to the excitement to run it, then it’s obviously even more special. PM: I agree with Michael and Lewis. For sure it’s really good to be here and to race at the same time. I can sleep a little bit more as well, so it’s good. Q: (Marco degli Innocenti - La Gazzetta dello Sport) Michael, in a German newspaper today, Ross Brawn said that the team, Mercedes, is guilty of having put you in trouble - I don’t know if I’ve translated it right from German into English - but I think the meaning is that they did not help you too much with the car, to give you a sufficiently good car. Do you agree with him, do you agree there is something or not? MS: No. I don’t agree with maybe your translation of it, because I think we have quite a good car, quite honestly, because if you think where we’re coming from last year, we have made a huge step forward. We have proven that we are able to win races. Yes indeed, I have been a bit on the unlucky side but you see we’re a team, we are one big family and we win together and we lose together, it’s part of it. It’s probably that that he wants to talk about. But no, I don’t feel at all disappointed - if anything, the reverse: more motivated because of how much progress we have made and I can see the future progress that we can make and that’s what is much more in my focus. Q: (Alexandar Tabakovski - Vecer) Michael, first of all, I saw you in Le Mans last week for the MotoGP race and you witnessed that Casey Stoner announced that he was retiring from the sport, stating that he was not content with the rules in MotoGP and in the motorcycling world, how the sport has developed. Can you tell me your feelings about that move and draw a parallel with your feelings about how Formula One is evolving in the situation whereby you are not liking it too much? MS: The first part I can certainly answer, as to what is my feeling, and my feeling is that most of those who have a little bit of involvement were surprised. So was I but then you have to respect that and I don’t know his reasons or his detailed reason but he’s young enough to have a sabbatical rather than a total stop and we’ll see. There’s definitely no parallel to me; it’s just that each one is very individual, why and for what reason he decides on his retirement. Mine, at the time, had nothing to do with any other reason than I wanted it to because I felt like I was tired, three years ago. That’s it. Q: (Cedric Voisard - Le Figaro) Lewis and Mark - because Michael expressed himself about it - Mark, you said that the public did enjoy the first five races. Lewis, you said, regarding the rules and the tyre situation, we are facing the same challenge, but, apart from that, do you enjoy driving within those rules? Can you extract 100 percent of the car and can you express your talents 100 percent? MW: The way the races have run in the last few years is different to previous years. In the era where we had pit stops with refuelling, the races were extremely aggressive. Obviously qualifying for the whole race, basically, pushing to make optimum strategies work and make sure that you’re hitting the lap times with the weight of the car, with the fuel that you have at the time, so whether you are on a two- or three-stop strategy or whatever. And then we went to no refuelling, so already the phase of the racing changed a little bit, in terms of a little bit of endurance aspect started to come into it, in terms of driving style and pacing yourself a little bit more, probably. And then we had the change with the Pirellis and that’s probably been the biggest change in driver technique and style that I can remember, certainly in my career and I’ve done a few Grands Prix. There are certain races - a huge majority of races - that of course even when you’ve won - I’ve won one race on Pirellis - but even when the winners are winning of course they are not driving at 100 percent and that’s just the way it is, because you can’t. You need to get the car to the end and produce the best lap times that you can for the duration of the race. That’s the way it is now. I still enjoy driving a Formula One car, I still love working with the engineers, driving the most amazing tracks against some great opposition. I enjoy that part of it but we always have to change, we always have to evolve as the technical side of the sport changes, and there’s always going to be nicer ways to… Personally, I enjoyed the sprint races and the refuelling, probably all of the drivers did, but the racing was not super-exciting. It was more precise, you had to be more precise, you had to be more on the limit and really really feeling the car for the whole two hours, but that’s not how it is now. We have a different set of challenges and that’s what we’ve got to do. LH: I don’t really know what else I can say, really. Mark’s said it all. I really enjoy the racing that we have now, as I’ve enjoyed it every year, and every year is a new challenge and I think that’s what the rules are there to give us is challenges. It is a little bit different, where we’re not pushing 100 percent in the race. There are some points in the race where you can really push but not for very long and perhaps it is more about endurance, as Mark said, to try and make these tyres last, but it is still a challenge to extract the most out of the tyres for a longer period. It still requires skill and technique and finesse to do that stuff so we’re still all trying to - speaking for myself - I’m still trying to get that fine touch sorted. But nonetheless, it’s still Formula One, it’s still fun and there’s more overtaking which is what people like to see. Q: (Ignacio Naya - DPA) Two questions for Pastor: how does it feel, your new life as a Grand Prix winner? Have you experienced changes in the last two weeks? Do you attract more attention? And secondly, you won here in GP2; do you feel that this track adapts to you, do you dream of doing it again tomorrow in Formula One? PM: OK, regarding the victory, it doesn’t change a thing. I think we need to keep working like that, keep pushing. As I mentioned before, we are not in the best position now against the other teams. We still need to keep improving. We have a lot of work to do. The car is getting more and more competitive every time, me as well. The feeling is really good. The atmosphere in the team is getting higher and higher, especially after the victory and now we need to continue like that, to push and push. And yes, Monaco is a special track for me, it’s my favourite one. I’ve always been very quick here. For sure I will do my best this weekend to get the maximum again. We will be competitive, I’m sure of that, but we will see. This is a typical track. You must put everything together to make the difference and I will try, together with the team, to do our best and then we will see. Q: (Bob McKenzie - Daily Express) Michael it’s not been the greatest start to the season, but I wonder if you’ve already cast your mind forward, if you’ve decided whether you might race next year, if you’re thinking about it, if you’ve got the motivation or the energy and despite the seven titles, do you still need to sell yourself to Mercedes or is it only your decision as to whether or not you will drive again next year? MS: No, the decision hasn’t really changed. So far we’re not focusing on what happens next year or in the future. It’s more about what happens right now and the team and myself will get together, so there’s no news for you yet, unfortunately. I don’t really want to get involved in deep discussion other than what I just said, so let’s leave it at that. Q: (Ian Parkes - Press Association) Lewis, you mentioned about being happier here in Monaco than you were in Switzerland. Can you give us the reasons why that is, what the differences between the two places are, and secondly, waking up in your own bed this weekend and being happier here, does that make a difference going into the race weekend itself? Could that boost your performance in any way? LH: When I lived in Switzerland, it was one of the most beautiful countries I’d ever been to. The weather was a little bit like England but more often it was better weather, but just where I was living, I was living away from the city and it was very quiet. It took ages to go out to a restaurant. I couldn’t jog down to a restaurant or walk to a restaurant. Here, it’s sunny every day which makes a big difference, there are great restaurants a couple of minutes from where I live, there’s a gym where I live, there’s a pool where I live. Before I used to have to drive half an hour to get to the gym, so things were just less fun there. I’m still in my twenties so I feel like I need to make sure I continue to enjoy them more and since I’ve been here, I’ve been much happier. Every day I go running on the track, I run round the track almost every day and it’s incredible to run around your favourite circuit every day. I go through the tunnel and I just cannot believe that I’m here. You have to pinch yourself every day, thinking wow, I’m running through the tunnel that the greats like Michael and Ayrton used to race around and now I’m one of those drivers but also living here. There’s a lot to it, but it’s spectacular. And for the race weekend? I don’t know if it’s going to make any difference, but it definitely won’t harm the weekend, being able to be comfortable in your own environment and surely that can account for something. For tickets and travel to 2012 Formula One races, click here. For Formula One and F1 team merchandise, click here.